It’s a tragic fact: many jaw-dropping, eye-opening, and heart-pounding research results never makes an impact on the scientific community. And it’s partly your fault. By “your,” of course, I mean all of us. Because when we waste the opportunity to share our results in their best light at a scientific conference or poster session, our viewers may overlook this valuable insight. But we can do better! With a little planning, collaboration, and hard work, we can make even a humble poster presentation a vehicle for inspiring the next discovery and building our scientific network. 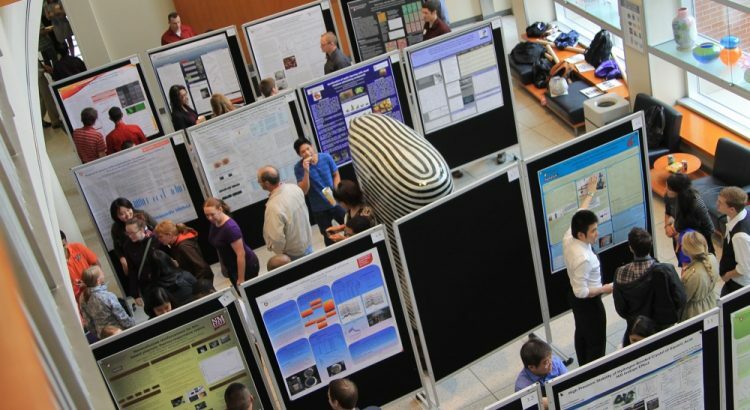 A poster session is a unique opportunity for a young scientist. As a viewer, you get the chance to engage in a casual conversation with other scientists, often one-on-one, about a topic that interests you. It’s an opportunity to ask for clarity, pose a question, or offer ideas without an audience of 200 staring at the back of your head. As a presenter, you get all of those benefits, as well as an opportunity to build your network and identify collaborators. You also get many chances to practice your ‘pitch’ as new visitors step up every few minutes. It will sharpen both your skill as a communicator and your research plan. And while there are probably some guidelines for being a good poster-viewer, in this episode, we focused our discussion on the best ways to prepare and present a poster. As with any presentation, answering a few questions before you get started will save you hours in front of the computer. If you are presenting to the Microbiology Conference, you may want to include more detailed background information than if you’re presenting to other experts in your sub-field at a Malaria Symposium. Space is limited, and thinking ahead about what your audience may, or may not, know will help you prepare for the proper range of visitor experience. You may be a wizard of poster creation and can put off your design until the night before you fly to the conference, but that’s a bad idea. Instead, leave extra time before printing share your file with collaborators for review. They need time to look over your work and offer feedback before it’s committed to (gigantic) paper. You’ll also need time to practice presenting the poster. More on this later, but sometimes the act of presentation lets us see where we have gaps or mistakes in the logic or design. It’s a good idea to practice with people from outside your lab because if they are already familiar with your work, they won’t notice when you skip steps or fail to explain a concept clearly. It may sound odd, but poster presentation is a form of story-telling. The best posters make that story clear and concise. Even if you have multiple projects in the lab, choose ONE to present in your poster. Start by jotting down a central question you’re trying to answer, or a hypothesis your lab is testing. Keeping this key idea in mind as you prepare the presentation will give you a firm structure on which to hang the other elements. There are a couple of broad guidelines to keep in mind as you create your poster. First, remember that the poster is a visual form, and space is limited. That means you should avoid printing long paragraphs of text. Instead, use the space to display graphs, images, and figures, with a few bullet points or figure legends to help the viewer track the story. Second, stick with a ‘standard’ layout. Your viewers have been trained for years to look for titles at the top and conclusions on the bottom right. You make viewing your poster harder by moving these elements around. Third, maintain consistency within your poster. Stick with one or two fonts, and be sure that headings, bullets, and figures are matched in style, weight, and size. Finally, give your work some breathing room. White-space is important, and will make the poster more readable. Manuscript titles are often formulaic and a bit dull as they describe the basic findings of the research paper, but your poster title can be more creative. The goal is to catch a viewer’s attention while also letting them know what they’ll see when they visit. Again, remembering your audience, include enough information to help them understand your main question or hypothesis. Avoid paragraphs, and include a figure or diagram if you can. This section is an absolute must, so don’t forget it! It lets the viewer instantly understand what the poster is about and what they can expect to learn if they follow you through to the conclusion. Again, a diagram or figure works great here. Use this section to help the viewer understand your experimental approach to the question. You don’t need to detail every last step – save that for the paper you publish! This is where the action is. Remember – you don’t need to include every experiment you’ve ever done. Just describe the results that help address the main question/hypothesis. Use descriptive figure titles that help the viewer understand your conclusion. “Gel of Protein X” doesn’t help anyone, but “Protein X is Up-Regulated After Drug Treatment” tells them what they should expect to see in the scan. Cut out extraneous information or parts of the image, and use arrows or boxes to help direct attention to the relevant parts. Double check this section for readability – axes and labels can often be too small to read from a four-foot distance. Another chance to draw a diagram! Or use 2-3 bullet points to help summarize what you’ve found. Some posters include acknowledgements or future directions. These are optional and might make sense on a case-by-case basis. Every poster should include the author’s contact info, though! This allows people to reach out even if you’ve stepped away from the poster, and helps collaborators keep in touch after the meeting. Crafting the perfect poster is only half the battle, now it’s time to describe that work from start to finish. Walking a viewer through your presentation should take roughly five to seven minutes. That doesn’t seem like a long time, but it’s an important target. Many presenters take too long to share the poster, leaving the audience bored, uncomfortable, and searching for a way out. By telling your story in five minutes, you let the audience guide the conversation. If they’re satisfied with your description, or bored out of their minds, they can move on to another poster. If they’re excited and want to learn more, they can ask questions or probe the results more deeply. As you present, remember that you mustn’t turn your back on your audience! You’ll be tempted to turn to look at the poster yourself, closing off the conversation. Instead, keep an open stance and point out relevant sections off to your side. Also, check your enthusiasm. Too many poster presenters seem bored, tired, or listless. If they don’t think their work is exciting, why should their audience?! Stop a moment to notice your energy level, and try to step it up as you present. Make eye contact, welcome new viewers as the approach, and modulate your voice. Your enthusiasm for your work can be contagious. Because most poster presentations occur one-on-one, it’s imperative that you actively tailor your pitch to the person standing in front of you. When they step up, you can briefly ask about their background or interest in the subject. If they’re a neophyte, you’ll want to avoid jargon and check that they’ve understood each section before moving on. If they’re an expert, they may want to skip straight to the results! Be aware of their cues and body language, and let them help steer the conversation. That’s it! Now you’re a poster-presenting-pro! Go make a splash at your next poster session, and be sure to share YOUR tips and ideas for poster presentation in the comments below. This week, we sample a very special ethanol that has probably traveled farther than we have. Jefferson’s Ocean Bourbon spends its time in a barrel bobbing around on a research ship as it sails around the world! Supposedly, all of that rocking, equatorial heat, and sea spray mimics the way bourbon tasted when it was shipped back from the New World. Best part: you get to read the Captain’s Log of each batch’s journey! 105: Listener Mailbag – Grad School Readiness, Paper Critiques, and More!